Here I am! I have been so busy at work and with school activities, foot ball etc for my daughters that I haven’t stitched much lately. The only thing I have been working on is this, my newest finish. Threads: CC as charted except I substituted Blue Moon instead of Vintage Violet as I wanted a more blue color for the words, dress etc. So, there are three down, only one more of these to go! They are a super fun stitch and fast too! 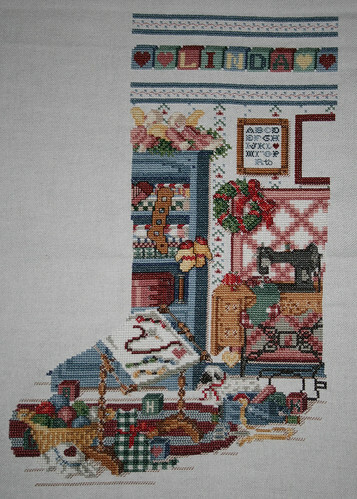 I have also been working on my Christmas stocking but it is slow going. I am getting a little bored with it. Only a month left until Christmas so I better get back to it! 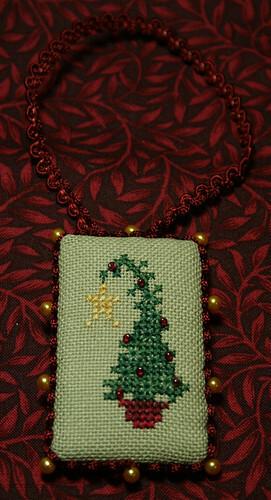 I think I am going to start the last of the Little Women thread packs ‘Baking’ and work on my stocking in between. Something like one night on Baking and one on the stocking. A little rotation. I think it will help me to get both done soon-ish. Next weekend I will be in London with the company I work for. It is a Christmas celebration for us and I am very excited to go! Since I do not have a significant other, I was allowed to bring a guest and I asked my cousin Bjarki to come with me. We always have so much fun anyway, and he is my best friend so I am sure it will be great! Productive Sunday with my daughters and mom. Me and my mom decided last week that we would spend today together and do some crafting with my daughters. Off course I brought something that I wanted to get done and decided to do some actual finishing on some of the things that have been stitched up and then put away. I am very happy about how much I actually got done. 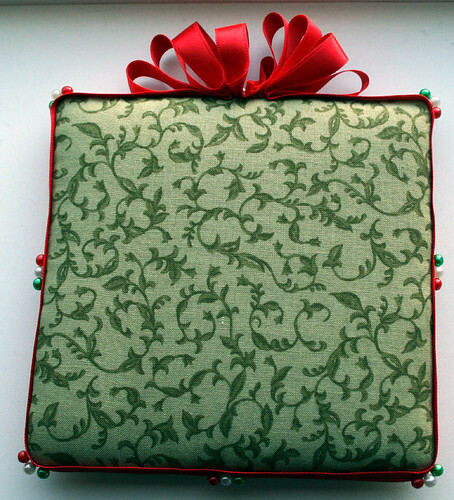 First I finished this pinkeep. I left it at my moms since it is a gift for someone. I am not saying who, just in case that person reads my blog. I am pretty sure that she doesn’t, but I want to be safe. 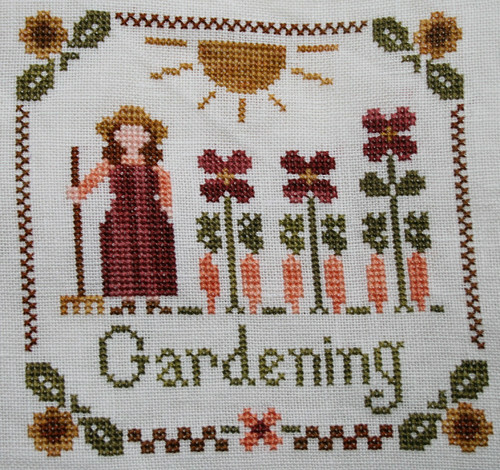 I stitched this design by Margaret Sherry years ago! Never got around to making it into anything though. So I decided to make a pinkeep out of it and love how it turned out. Lately I have been thinking about my stitching and how little I actually have of it. I seem to give almost everything I make away. So, I decided that I would start collecting ornaments that I make for myself. Stitched ornaments preferably. 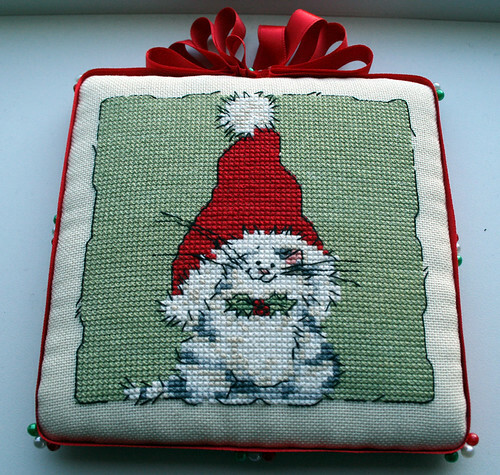 When I went through my box of stitched things I found a couple of projects that were just perfect for ornaments so I brought them along and finished them up! Design by Helga Mandl. 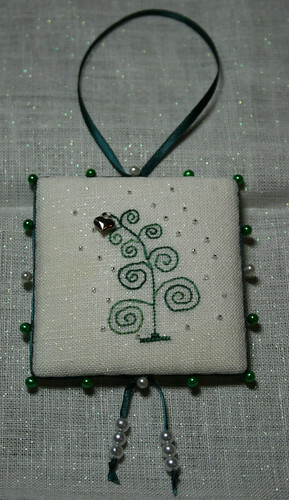 Stitched on 36ct Opalescent White Linen with DMC 4045 with a silver heart on top and silver/clear beads as snowflakes. 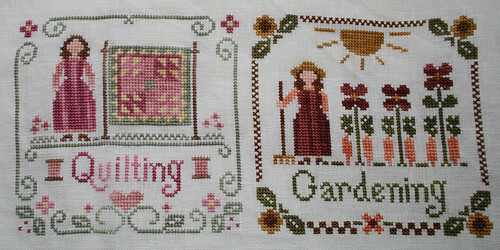 Stitched in 2007. From 2007 JCS Ornament issue. 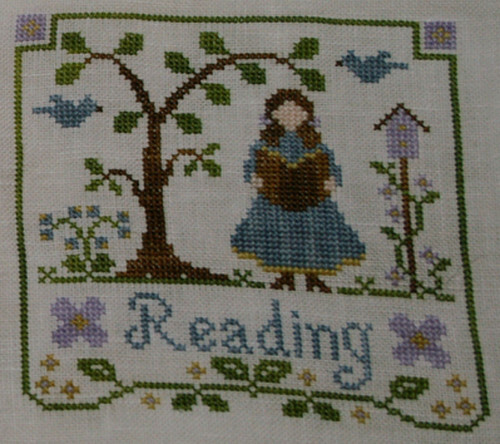 Design by Charland Designs Inc. Stitched in 2007. I am getting there! I finished all the stitching this weekend and started the back stitching. I am so happy! I am now going to take a little break from it just to keep it interesting as I really do not want to get bored with it at this point. There is not that much left to do now. I was going to take a picture before I started the back stitching, but I was so excited that I forgot! I had a pretty good weekend. I was extremely lazy and just stitched and ate and had a nice relaxing weekend. Aisté and Rósa came over on Friday for dinner and some stitching and my cousin Bjarki also joined us. Saturday was just plain lazy. Lots of stitching. And on Sunday me and Aisté went out and had coffee and cake and walked a little around in the mall. Then back home and more stitching. Hope you all had a great weekend!